This week gave us below normal temperatures along with on and off rain showers that only let up for a day and a half. Our guests however were hardy souls not letting the weather get them down and as a result they were rewarded with fabulous fishing. Long time guest Mike Uebehlerr Stow, OH returned with his daughter Kate and her fiancé Chad who are currently living in Ethiopia and few almost half way around the world to fish with Mike. 1st day out they had a blast catching some fish while fighting some very strong winds. Second day was great as they caught Smallmouth Bass, Northern Pike, and Muskie. Both Kate & Chad caught HUGE Trophy 19.5-inch Smallmouth and Chad had his first encounter with a Big Muskie as it hit his lure at boat-side, thrashed violently and as Chad did his best to keep it on the fish did what Big Muskie tend to do more often than not, throwing Chad’s lure and waving goodbye to him with it’s tail. 3rd and final day was a great finish to a terrific trip as they caught over 70 Northern Pike. They all had a fabulous time making some wonderful family memories together. Every year guests since 1999 brother and sister Tom Nayder Orland Park, IL Leah Bezin Norwalk, WI with good friend Dave Sivicek Pierceton, IN who brought his wife Helen, and son-in-law Dan daughter Katie and granddaughter Ade for their first experience. 1st day they went out and caught Smallmouth Bass, Northern Pike and Dave landed a beauty spotted Muskie. 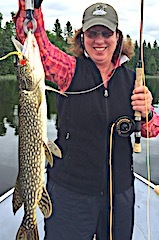 2nd day had them doing fantastic with Leah and Tom catching 38 Northern Pike, Leah catching one after another fly-fishing and the Sivicek family caught just as many with Ade catching her 1st and 2nd Pike ever both over 30-inches, and Helen caught her 1st Northern Pike Fly Fishing. 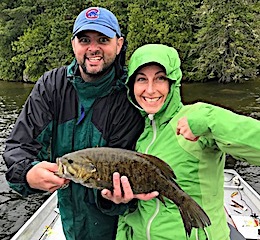 3rd day was great catching a mix, Leah landing a Muskie keeping her Muskie queen title and also an 18-inch Trophy Smallmouth Bass and Tom caught 2 Trophy Smallmouth at 18 & 19”, and others were caught in the 17-inch range. 4th day was a great day catching many Northern Pike in the inclement rainy and cold weather with temperatures reaching a high of only 55F. 5th and final day was very good for Tom & Leah catching Smallmouth Bass, Tom with an 18-inch Trophy and Leah with a 19 & 20-inch Trophies. All left very happy for the memories they made but somewhat sad it was over. Back for there 16th consecutive year were Jerry Amer & Bill Calhoon from Columbus, OH. DOA these two got to it catching 57 Smallmouth Bass with lots in the 16-17.5-inch range and Bill caught 4 Trophy Size between 18-19-inches with Jerry catching one that size. 1st full day was even better catching 70+ Smallmouth Bass in the same size range and Bill had two-trophy size over 18 and Jerry had one. They also caught a big pike in the mid 30-inch range and two Muskie 33 and 34-inches. 2nd day they targeted Muskie catching two at 33-inches and Bill landed the largest, a nice 36-incher, while also catching a few Pike in the 30-inch range and some Smallmouth Bass. 3rd day had these two catching 20 Smallmouth Bass with two Trophy size and 54 Northern Pike. Their 4th and final day they, they thought was an off day at first as the weather, cold & rainy, beat them up, but after tallying their total they caught 36 Smallmouth Bass with 3 over 18-inch Trophy fish and 21 Northern Pike. When departing they both laughed and said they are spoiled with the fishing at Fireside Lodge. They caught 19 Trophy Smallmouth Bass between 18 to 19.5-inches for their 4 days, 4 Muskie & countless Pike. Jerry will be returning with his Grandson at the end of July and both reserved the same dates for 2018. Back for their 16th consecutive year were father & son Jack & Steven Starnes from Wise & Duffield, VA 1st day these two did great catching 50+ Smallmouth Bass and 60+ Northern Pike. 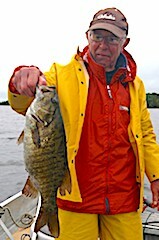 2nd day was a fantastic Smallmouth day catching over 100 BIG Smallmouth Bass on surface poppers. 3rd day was targeting Muskie catching 5 and losing a few along with landing 20+ Pike and a few Smallmouth Bass. 4th day was another day targeting Muskie having very few follows but catching 2. 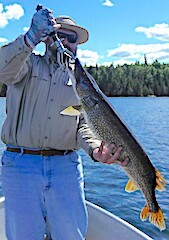 Steven with a nice 33-inch and Jack caught a Huge 45-inch Trophy Muskie, which made the whole day. Later in the day they fished for Smallmouth Bass catching 35-40 nice fish all being 16.5 to 18.5-inches. 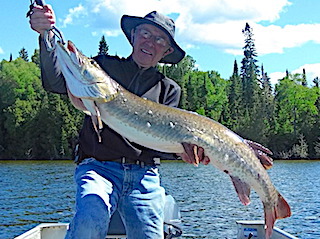 5th day was a special day in any Fishers book as Steve caught a 40-inch Trophy Northern Pike and Jack caught a 46.5-inch GIANT Trophy Muskie. They also caught about 20 other pike and 25 Smallmouth Bass. 6th and final day had them catching 35 Smallmouth Bass and 30 Northern Pike. Both left having another great father and son fishing trip & made their reservations for 2018. Another guest returning for their 16th consecutive year were very good friends Don Landbo & Dan Szkolza from S Elgin, IL and Sugar Grove, IL. 1st day despite the windy conditions they caught 26 Smallmouth Bass, 5 Pike with Don landing a Trophy over 18-inches and Dan catching two Trophies. Also each caught a Muskie. 2nd day was a super day catching 9 BIG Smallmouth Bass and 176 Northern Pike using Buzz Baits 80% of the time. 3rd day had them catching 122 Northern Pike using Buzz Baits, & 16 Smallmouth with 5 being Trophy Size over 18-inches. 4th day they caught 116 Northern Pike & 12 Smallmouth. 5th day was focused on Smallmouth Bass catching 28. The 6th and final day they were searching for both Smallmouth Bass and Muskie finding them both catching 32 BIG Bass plus Dan landed 2 Muskie with one being a very large 39-inches. This ended their trip on a high note and after taking their traditional picture in front of my tackle shop they reserved the same dates for next year. 1st time guests George Siemer and his sons Alex & Andy from Hamilton and Harrison OH were excited to arrive & fish our well know excellent Smallmouth Bass fishery. 1st day before supper the caught over 3-dozen nice Smallmouth & both Alex & Andy landed a very nice Northern Pike. 2nd day was even better as they caught 57 Smallmouth Bass with Andy catching a Trophy at 18-inches & a 31-inch Pike. 3rd day they caught 28 Smallmouth Bass with a few Northern Pike. 4th day they did well on both Pike and Smallmouth Bass with Andy catching a BIG heavy 37.5-inch Northern Pike and had some fast action on Smallmouth after supper with both Andy & Alex catching BIG Smallmouth Bass on surface poppers. 5th and final day was a great finish with them catching 38 Northern Pike both Alex and Andy landing 19.5-inch Trophy Smallmouth Bass and George caught a large 42-inch Muskie. All left making great father and son memories for years to come. Ted Payseur & Jan Anderson from West Des Moines, IA were here for there 3rd year in a row bringing with them 1st year fishers Alan Lepley from Plymouth, MN and Gerhard Rivera from Phoenix, AZ. 1st day out they caught a mix of Pike and Smallmouth Bass. 2nd day was a Pike fest as the caught many Northern plus Jan landed an 18.5 and 19.5-inch Smallmouth Bass & Gerhart caught an 18-inch Trophy. 3rd day Jan & Ted fished together having a banner day catching 43 Smallmouth Bass with 18 being over 17-inches and 11 Trophy Smallmouth Bass over 18-inches, each landing 20-inchers, 4 at 19-inches, and 6 between 18 to 18.5-inches. WOW, what a fabulous day!! The next day had Alan & Gerhard having fantastic Northern Pike fishing Alan saying they caught as many pike as they wanted to as long as they kept fishing. 5th and final day weather & wind were not on their side however Ted & Jan still managed 14 Smallmouth Bass with 8 over 17-inches and 2 over 18-inches. This ended a great fishing trip for these guys to talk & reminisce about for some time to come. Paul Capecchi with son Tony from Inver Grove Hgts & Woodbury, MN returned for their 15th year in a row, 17th trip, and with them for the 2nd year was Tony’s wife Jody and their 3-year old son Joseph. They wasted no time on the DOA going to an original familiar location, Chicago Bay, all catching Pike. 1st full day had Paul & Tony hunting Muskie with Tony landing two up to 35-inches and also caught a 38.5-inch Northern Pike. They also caught 5 Smallmouth Bass and 3 Trophy fish 18 to 18.5-inches. 2nd day Tony & Paul went fishing catching over 100 Northern Pike. 3rd day all four went fishing catching many Northern Pike again, Jodie catching a fish on her 1st cast & was on top of the daily leader board. 4th and final day Paul & Tony caught over 50 Northern Pike along with 8 Smallmouth Bass and Tony caught 3 Trophy Smallmouth Bass 18-inches plus. The also took a fun family boat ride to see Twin Falls which concluded a fabulous family fishing vacation making three generation memoires that will last their lifetime. Before departing Paul made their reservation for 2018. Thanks for choosing Fireside Lodge to make your special family memories together. Returning for their 4th trip were father and sons Dan, Adam, & Ryan Spartz from Columbus, OH and with them for his first Fireside Lodge experience was Frank Berry from Savannah, GA. 1st day these guys had a fantastic Northern Pike day catching 102 total. Both Adam & Ryan said the fish were all bigger with al lot of fight and Frank caught his biggest Northern Pike ever measuring a fat 34-inches. 2nd day this group targeted Smallmouth Bass with Adam & Ryan teaming up for a total of 25, Adam catching a Trophy over 18” and Frank also caught an 18.5-inch Trophy Smallmouth. 3rd day had Adam & Ryan catching exactly 50 Northern Pike and Dan hit a milestone landing his very 1st Muskie measuring 33-inches. 4th day had them searching out Smallmouth Bass doing well catching 35-40 fish and Frank landed a trophy 18.5-incher. 5th day was a Pike fest with the group catching well over 100 Northern Pike. 6th and final day Frank took the day off so Dan, Adam, & Ryan went Muskie hunting having a fantastic day hooking up on 6 Muskie, landing 3 and Dan came up with the largest at 37-inches. This ended their trip with much to talk about on the travels back home. Back for their 2 consecutive year were brothers Craig & Jeff Wilson from the Greater Toronto Area and Nova Scotia. These two had a great first day catching some BIG Northern Pike and Smallmouth Bass. 2nd day was great catching 34 fish total, a mix of Smallmouth Bass & Pike both landing Trophy Smallmouth, Craig at 18.5-inches, Jeff a huge 19.5-inches and Craig caught a Trophy 40-inch Northern Pike slamming his Zara Spook after missing Jeff’s. 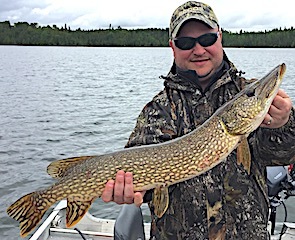 Jeff also had a much bigger Pike miss another top-water bait right at the boat. Almost all their fish were caught on the surface with the Zara Spook being the lure of the day. 3rd day they caught Pike & Smallies and Jeff had a very big Muskie roll on his lure. 4th was a day of lots of BIG follows while hunting Muskie and Northern Pike, catching a few but not able to hook up on the Trophy fish they were looking for. Last two days they searched for big fish catching some Pike in the mid 30-inch range and on the last day within the last 3-4 hours Craig got hot catching the Tri-Fecta, a Northern Pike, Muskie and landed a huge 19-inch Trophy Smallmouth Bass. This put an exciting finish to a fabulous brother fishing trip. When departing Craig yelled out, See Ya Next Year. Back for their 6th time were Jim, Rich, Pim Shell Knob & Carthage, MO. Robert Dorsey Sarcoxie, MO. Steve Howlett Shell Knob & Steve Barton from Shell Knob and Joplin, MO. Joining them for their 1st time were Doug Pim from Frisco, TX Scott Bryant Glencoe, MO. & Aaron Elliott from Springfield, MO. DOA Rich & Doug teamed up for over 40 Smallmouth Bass almost all over 16-inches with Rich’s secret being the Ned Rig. The other 3 boats all caught between 30 to 35 Smallmouth Bass per boat Robert & Steve B caught 5 over 18-inches and Scott caught 33-inch Pike. 1st full day they caught 30 to 40 Smallmouth Bass per boat plus 20 to 30 Northern Pike per boat. Most of the Bass were 16-17.5-iches & many Trophies over 18-inches were caught. 2nd day they tore the Smallmouth Bass up catching over 200 as a group. 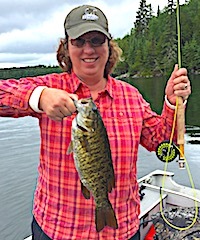 3rd day was slower, but each person in the group caught a Trophy Smallmouth Bass between 18–20-inches with Rich landing the 20-incher. 4th and final day wind made it difficult Smallmouth Bass fishing but all caught Fish and everyone landed a Smallmouth Bass 18-inch to 19-inches. All left very happy and already looking forward to a return trip in 2018. Father, sons, and Grandson Dennis, Ross, Chadd, & Jason Beavers from Cozad & McCook, NE were at Fireside Lodge for their 1st time. DOA they caught both Smallmouth & Pike. 1st day Dennis caught his first ever Muskie while Ross, Chadd and Jason caught a mix of Smallmouth Bass & Pike and Ross caught a very nice 18-inch Trophy Smallmouth Bass. Second day they did well locating some big fish, getting many follows and landing several nice size Northern Pike. 3rd day was great fast action as they caught about 75 Northern Pike as a group having many other strikes & misses. 4th and final day had Chadd & Jason catching many Northern Pike while Ross & Dennis chased some bigger fish catching some Smallmouth Bass and Northern Pike. All left having had great family fun making wonderful memories together. Thanks for choosing Fireside Lodge to do so.